The Hyde family is unique. In the more than 25 years that I have known them I have been drawn to Yeshua’s presence in their lives. Their home and activities are a combination of worship, joy, hunger for more of God and a pioneer spirit. It is no easy thing for an established family to land in Israel and make the adjustments of language, culture, relationships, education and economics that are involved. Richard and Carolyn came to Israel after the bold step of investing two years in Germany, obeying the Lord in an exceptional calling. They went first to experience reconciliation in their own hearts, then to bring reconciliation between Jews and Germans. As Messianic believers, their approach was to show the Jewishness of Jesus, enabling German people to identify with the Jews through the Savior they’ve associated with the Church. I have known Richard and Carolyn for many years, first in Virginia Beach at Beth Messiah many years ago where they were a strong presence and gave much in worship and encouragement. Carolyn’s gifts in music and worship were already evident. Then in San Antonio, they were for many years an eldership couple; Richard with teaching, wisdom, board leadership and Carolyn with special gifts of music, writing and more. They are people of faith. Since they made Aliya (immigrated to Israel) they have been connected to congregations related to Ohalai Rachamim, whose leader Eitan Shishkoff has been an integral part of Tikkun International since its inception. They are people of faith and solid commitment. Richard and Carolyn Hyde are such jewels in the treasury of God’s kingdom in the Holy Land of Israel. Our church takes very seriously the stewardship of our support funds and few ministries have proven to be more fruitful than this planting ministry in a land where our Lord and Messiah is so badly needed. They exhibit the fruit of the Spirit in all their dealings with us and have had such an anointed ministry when they have been to our church to speak and sing. I urge you to have them bless your people and ask you to consider becoming a part of their ministry through supporting this vital and rare ministry of planting congregations in one of God’s favorite corners of the world. Richard Hyde is a long time friend of mine. We were part of a church in Oklahoma City that turned into a Vineyard in the mid 1980’s. Richard is a gentile, but he and his family always had a burden for Jews and Israel. As a single person doing a lot of mission work around the world, he spent a year or two of that time in Israel. He then came back to Virginia Beach, VA and married a Messianic Jewish woman, Carolyn. She is gifted in leading worship with guitar or piano and has four CDs of worship music out; the music often being minor key Jewish melodies and some in Hebrew. When Gwen and I were in a tour of Israel in June of 2002, I was at a Christian book store on the Sea of Galilee and saw one of her CDs for sale and bought it there. Richard and Carolyn moved to San Antonio, TX, where he started a real estate appraisal business and they started a Messianic Jewish congregation; eventually they turned it over to a pastor and elders. I spent a long weekend with them in the early 90’s in San Antonio and attended their Messianic congregation and was greatly blessed there as Carolyn led worship. Richard and Carolyn are more apostolic in nature, being able to start things and turn them over to others. They then moved to Germany and had a ministry of reconciliation between Jews and Germans there. They spent a lot of time in various groups and schools where Carolyn would play a guitar and sing and Richard would teach. Many came to know Yeshua while they were there. They then made the Aliyah to Israel. They do a lot of street ministry; Carolyn is a natural evangelist in the way she just meets people in stores, on the street, in buses, and usually has a story of divine appointments on a weekly basis. They are a part of Ohalei Rachamim, Tents of Mercy, network of Messianic Jewish congregation. They host visiting Christian and Messianic Jewish groups as well as engage in a worship, praise and evangelism ministry. They also go back to Germany and minister in the public schools and churches twice a year. They are an inspiring couple. Their enthusiasm and efficacy for bringing Jews to a knowledge of Yeshua is amazing. The anointing of Carolyn’s music and Richard’s preaching is evident in what I’ve seen of them. I highly recommend them to speak and minister. Richard und Carolyn traf ich vor einigen Jahren in Israel, als ich gerade mit einer Jugendgruppe unterwegs war. Den Tipp bekam ich von einer jungen Mitarbeiterin unserer Gemeinde, die sie auf ihrer Reise durch Israel erlebte. Zusammen mit einer Freundin besuchte sie unbekannterweise Familie Hyde und wurde dort herzlich empfangen und aufgenommen. Scheinbar waeren auch Jugendgruppen willkommen? Das wollte ich testen, machte mit meiner Gruppe einen Termin bei ihnen aus – und tatsaechlich konnten wir dort biblische Gastfreundlichkeit erleben. Seitdem ist ein Stop bei Familie Hyde bei allen unseren Israelreisen fast schon ‘Pflicht’. Je nach Wunsch werden die Begegnungen als kleine Gottesdienste, Lobpreisabende oder einfach nur Zeiten der Begegnung gestaltet – meist mit richtig leckerem Essen! Doch viel wichtiger ist fuer mich, was ich hier in Deutschland mit Ehepaar Hyde erlebe. Es klingt fast zu schoen, um wahr zu sein, es entspricht jedoch vollkommen der wahrheit! Ehepaar Hyde gestaltet Schulstunden für deutsche Schulklussen. Schon oft begleitete ich sie als Übersetzer, Fahrer, Freund… Meist sind es Doppelstunden und ueber einen lockeren Einstieg mit Kultur, Tanz und Gesang landet man dann bei der Bibel. Und beim Messias. Und ganz am Ende folgt ein Entscheidungsaufruf, wer Jesus in sein Herz aufnehmen moechte. Und ganz gleich, welchen Alters die Schueler waren (bis Klasse 13): Sehr viele, oftmals sogar die ganze Klasse (!) hebt die Hand und sagt ‘Ja’ zu Jesus! Ich weiss, das ist schwer vorstellbar, entspricht aber der Wahrheit! Dieser Dienst ist allerdings nur moeglich, wenn man von einem glaeubigen Lehrer eingeladen wird, der sich dann auch um die Nacharbeit kuemmern kann. In freien evangelischen Schulen haben wir im Anschluss manches Mal Jugend-Alphakurse in der Schule angeboten oder die jungen Leute staatlicher Schulen am Ende einer solchen Woche mit mehreren Schulbesuchen zu einem extra fuer sie gestalteten Jugendtreff eingeladen. Hin und wieder habe ich dann in unserer Gemeinde einen Info-, Lobpreis- und Gebetsabend mit Ehepaar Hyde organisiert. Dieser Abend diente dann nicht nur der geistlichen Auferbauung, sondern auch dem Fundraisung – da die Aktivitaeten in den Schulen natuerlich alle kostenlos angeboten wurden, Flugtickets, Reisekosten, etc. aber ja auch bezahlt werden sollten. Summa sumarum kann ich Richard und Carolyn uneingeschraenkt empfehlen, arbeite auch in Zukunft voller Freude weiter mit ihnen zusammen – und wuensche ihnen fuer jeden einzelnen Schritt und Dienst von Herzen Gottes reichen Segen! I met Richard and Carolyn Hyde around 2001 and have been in friendship and contact with them since. I have had numerous ministry evenings with the Hydes in the context of Israel-evenings, conferences and other events, mainly in the context of prayer, worship, bible-teaching. Carolyn is a great song writer and worship leader. Richard is an excellent teacher especially on topics which refer to the Jewish-Christian connection and relationship and Alijah. Also we had a number of tour groups from Germany of all age groups visit them and have fellowship with them. Richard and Carolyn deserve our support and trust as Christians from Germany and it is a joy to minister together with them especially in the context described above. My name is John Love and I retired two months ago after 28 years as an associate pastor at Trinity Fellowship Church in Amarillo, Texas. My wife and I along with 35 other people founded this church thirty-seven years ago and we have grown to a congregation of about 12,000. 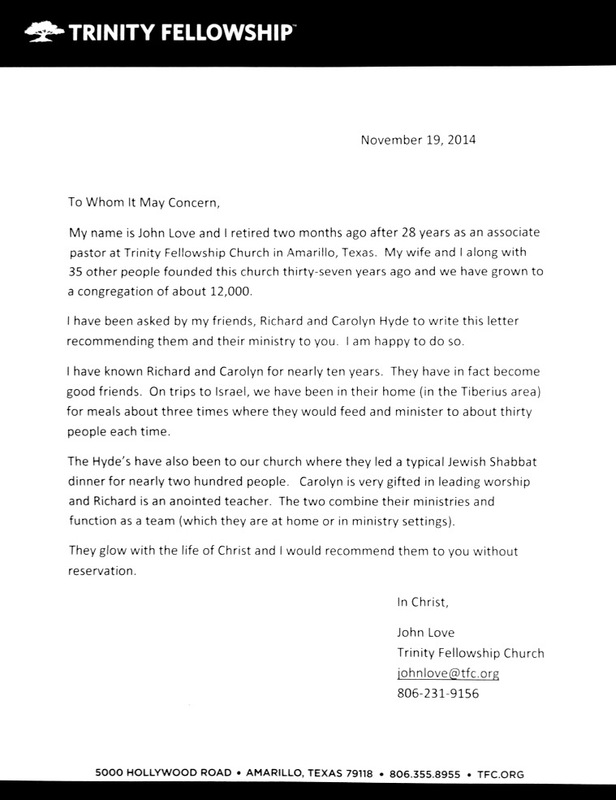 I have been asked by my friends, Richard and Carolyn Hyde to write this letter recommending them and their ministry to you. I am happy to do so. I have known Richard and Carolyn for nearly ten years. They have in fact become good friends. On trips to Israel, we have been in their home (in the Tiberius area) for meals about three times where they would feed and minister to about thirty people each time. The Hyde’s have also been to our church where they led a typical Jewish Shabbat dinner for nearly two hundred people. Carolyn is very gifted in leading worship and Richard is an anointed teacher. The two combine their ministries and function as a team (which they are at home or in ministry settings). They glow with the life of Christ and I would recommend them to you without reservation.